This mod allows Serana to transform into a Vampire Lord during combat. Unlike other mods with similar functionality, this mod does not require the Player to transform into a Vampire Lord / Werewolf. Serana can choose to transform herself. - Feel free to redistribute this mod in unedited form on any page other than nexusmods.com, under the conditions that 1) you give me credit for the work I have done, 2) clearly state that any users of whatever page you upload to should not start bothering me for support, and 3) you are not asking users to pay for the mod. - Feel free to redistribute this mod in edited form on nexusmods.com (or any other page), under the same conditions as above. - Looking at how I implemented features and using some parts in other mods is fine, assuming that 1) you give me credit for the work I have done, and 2) you are not asking users to pay for the mod. - Feel free to feature this mod in any kinds of videos. I would appreciate if you can include a link to the mod page somewhere, and if you could let me know about featuring the mod in any videos such that I can also link to it from the mod page. - The Elder Scrolls V: Skyrim on PC. This mod allows Serana to transform into a Vampire Lord during combat. As far as I'm aware, the only other mods which implements this functionality are Amazing Follower Tweaks and Serana Secret. 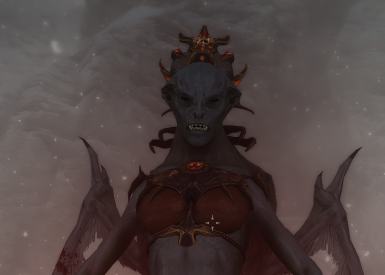 However, in these mods (if I'm not mistaken), she'll only transform into a Vampire Lord whenever the Player also transforms into something (Vampire Lord or Werewolf). This mod is for players who don't want to transform into anything themselves, but still want Serana to be able to transform. - Serana will only transform into a Vampire Lord in combat, and transform back to normal when combat ends. She will not transform in every single fight; only if she is fighting at least 3 enemies, or if she is fighting a Dragon, Giant, Vampire Lord, or an opponent with a higher Level than her. - Serana will not transform if there are living members of the Dawnguard and/or Vigilants of Stendarr factions nearby, or if there are living Guards nearby. - Serana will not transform if she is in a town, settlement, village, or other kind of similar area. - Serana cannot transform when she is sitting or swimming. - Serana will not use any of the new spells typically given to a player Vampire Lord; she'll continue using her own spells. If Serana ever stays in Vampire Lord form and doesn't appear to revert to normal form, just activate her (talk to her). If she's not currently in combat, she should transform back to normal. The mod can be customized a bit using console commands. It is recommended to only use these when not in combat, preferably in an area like a town where she cannot transform, and when she is not currently a Vampire Lord. To use console commands, open up the console using the tilde key (~), type any of the commands listed below (without quotation markers), and press Enter. Like any other mod, install through the Nexus Mod Manager or simply make sure the .bsa and .esp files are placed in the Skyrim\Data\ directory. Make sure the plugin (.esp file) is also activated. The load order should not matter, since this mod only introduces new records (it does not modify any existing records). - Make sure Serana is not currently a Vampire Lord, and go to a safe area (such as a town). - Use the console command to deactivate the mod (see Section 4). - Save the game, then deactivate and uninstall the mod (either through NMM/MO, or by simply deleting the files originally installed). - Other mods that allow NPCs such as Serana to transform into a Vampire Lord (such as Amazing Follower Tweaks): Make sure to prevent those mods from also transforming Serana into a Vampire Lord, things will probably go wrong if two mods try to do that at the same time. - Better Vampire Lord Transformation: Probably compatible, but it won't affect the way Serana looks. Serana will still look like Vampire Lords in vanilla Skyrim+Dawnguard do. 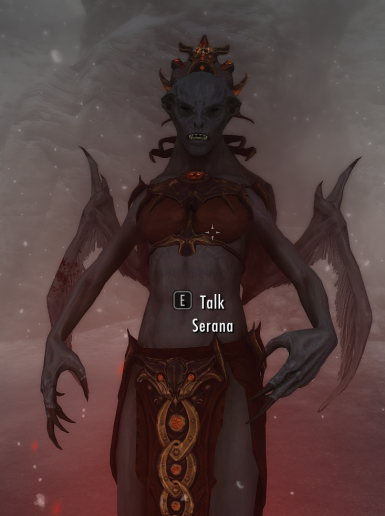 - This mod is compatible with mods that modify Serana in other ways, such as Superb Serana (which modifies how she looks in her normal form) or Seranaholic. The configuration options leave a lot to be desired, currently only supporting configuration through console commands. I don't plan to change this myself, since doing so is rather tedious and boring work. If anyone else wants to make this more user-friendly, they have my permission. - Can you implement/change <insert some feature>? No. I do not plan to spend a lot more time on modding. I primarily create mods for myself, and then just share them in case anyone else also happens to like what I created. The source files of my scripts are included in the download, so if anyone thinks something should be added or changed, they are free to do so (assuming they give me credit for my work when sharing any changes). - Can you add an MCM configuration menu? No, see answer to the question above. - Can you upload this on another page, like bethesda.net? No, I don't like uploading to that page personally. Anyone else is free to upload it there themselves though, assuming that 1) they give me credit for the work I have done, and 2) clearly state that users of that page should not start bothering me for support. - THIS MATERIAL IS NOT MADE, GUARANTEED OR SUPPORTED BY ZENIMAX OR ITS AFFILIATES. FOR ANY CLAIMS, WHETHER OR NOT THEY ARE RELATED TO THE DOWNLOAD. I will probably keep an eye on the comments section for a few days after uploading this to the nexus, to see if any important issues occur early on. After that, I will go into hibernation again (meaning that I'll be playing Skyrim myself instead of looking at the comments section). I can still be contacted on the nexus by PM for any really important questions or messages. With ''important'' I don't mean questions that you could answer yourself by reading the readme, those should still go into the comments section where other people may be able to help you out if they're feeling nice.